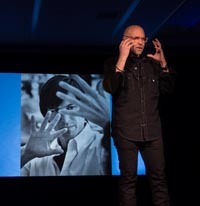 Courtesy photo by F. Alfredo Rego Photographer Doug Menuez, who has documented the digital revolution in California’s Silicon Valley since 1985, demonstrates his images Monday afternoon at the Sun Valley Inn during the inaugural Dent the Future conference. The photo on the screen behind Menuez, taken by him in Sonoma, Calif., in 1986, shows Apple co-founder Steve Jobs almost as though he were conjuring the future, shaping it to his whim. The Dent the Future leadership conference in Sun Valley is about grabbing the future by the horns and owning it. The inaugural event, which brought about 100 of the nation’s top techies to town this week, is not about adjusting to the passage of time but molding it to be what you want it to be. But neither is it about picking up the biggest sledgehammer around and making a dent in the future, it’s about inventing a tool better than a hammer. A recent news release from Dent the Future LLC states that the conference, co-founded by Parnassus Group founder Steve Broback and tech writer Jason Preston, “aims to translate the success of great leaders in business, politics or charity into a set of lessons for those who can put a dent in the future.” According to Broback, the event is named after Apple co-founder Steve Jobs’ famous “We’re here to put a dent in the universe” quote. The conference—which took place Sunday through today in conference rooms at the Sun Valley Inn, on the slopes of Bald Mountain and at restaurants in Ketchum—functions as a part lecture series, part mixer. Though the event features several bigwig speakers—such as Alvy Ray Smith, co-founder of Pixar Animation Studios, Harper Reed, chief technology officer for President Barack Obama’s re-election campaign, and Cathie Black, former chair and CEO of Hearst magazines (think Cosmopolitan, Oprah, Esquire)—the conference also serves to foster conversations among its attendees and speakers that might otherwise not take place, but could have a profound effect on the offing. That’s where the skiing and eating come into play. At Dent, Jobs is both revered and feared. Today’s techies have placed him on an almost messianic pedestal, yet some of the speakers and attendees who worked with him directly had war stories to share. Smith joked about how Jobs could be a “volatile personality sometimes.” However, nobody dared discount his knack for leadership, his ability to make products fly off shelves or his charisma. Photographer Doug Menuez, who has documented the digital revolution in California’s Silicon Valley since 1985 when Jobs was forced out of Apple after losing a boardroom battle, demonstrated his images Monday afternoon, including a picture of Jobs taken in Sonoma, Calif., in 1986 in which he appears to be conjuring the future almost as if he were a sorcerer—or a god—creating the world of his fancy, shaping it to his whim. The conference adopted that photo as its image, displaying it in the lecture and lunch rooms and even putting an original print, signed by Menuez, up for auction to the attendees. UCLA Associate Professor Maia Young spoke Monday morning about “managerial mystique.” She said great leaders such as Jobs, like great magicians, create illusions of charisma that cause people not only to believe in and follow them, but also to assign almost superhuman intelligence to them, such as an ability to “predict real GNP growth,” even though that kind of knowledge would have been far outside Jobs’ field of expertise. “Leaders don’t just have to be good at what they do, they have to manage [other people’s] interpretations of their success,” she said. “I like to challenge people to think what will be possible,” Smith said. According to Preston, the conference will return to the Sun Valley area around the same time next year.